As much as I love Mugspotting, let’s face it, it’s a landscape overrun by the likes of the common or garden ‘Cambridge’ & white bread ‘Sparta’. They’re 10 a penny. This one could divide opinion. Mugspotters HQ was split 50/50. Once the euphoria had faded it was time to behold it’s rarefied form. It’s a mash-up between the Marrows slender, plunging body and the Sparta’s angular, jutting handle. Maybe there was some inbreeding on the potters wheel? Personally, I may just be stuck in my ways but the Spartan handle is best suited to a body with a low centre of gravity and for me, doesn’t sit well astride the top-half of the svelte Marrow. The Jam: ” (A) Going Underground” / (AA) “Dreams Of Children” (1980) That was a classic that went straight in at No.1!! 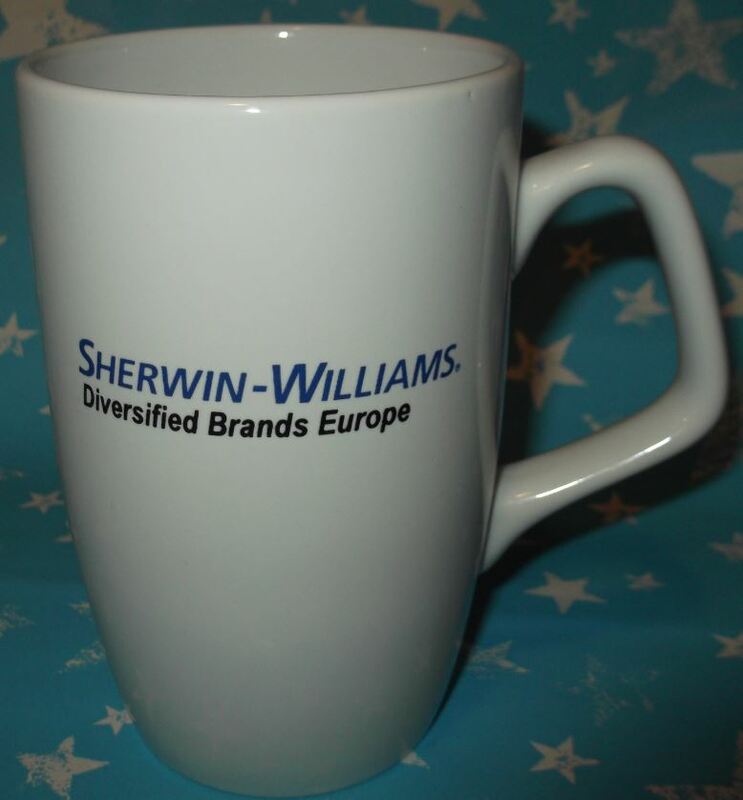 This Corporate sports a “Double A” side of “Ronseal” / “Sherwin Diversified Brands”. 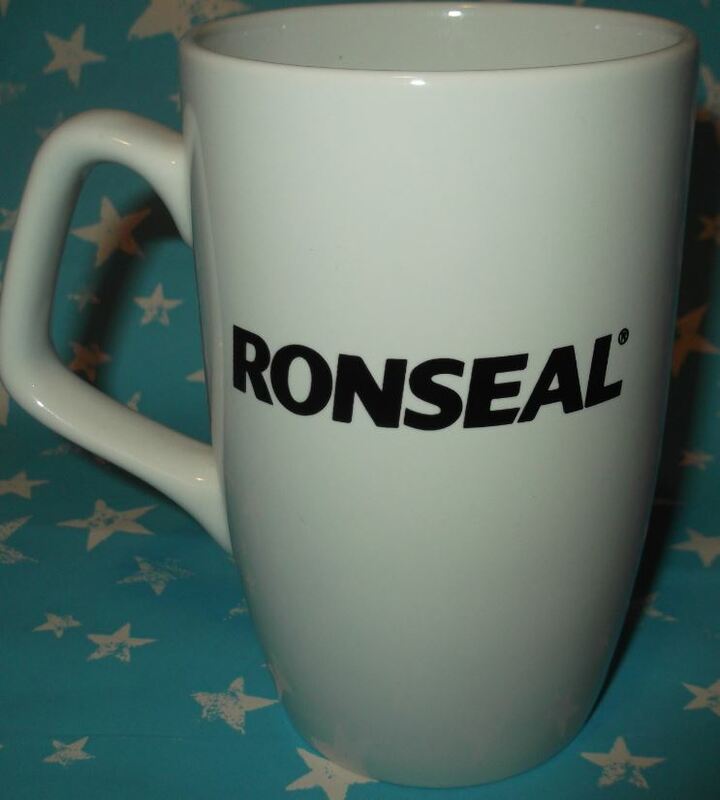 Most of our demographic should be familiar with Ronseal and their famous ‘It Does Exactly What It Says On The Tin’ slogan. In short, they manufacture high quality woodcare products, paints & DIY gear for both inside and outside the home. Sherwin Williams Europe (actually based in Cleveland, Ohio) own the Ronseal brand. It may have made more sense having both logos feature on the same elevation and then repeat this doubled up motif on it’s rear. However both brands are kept apart, each having it’s own important identity, thus making this debut Corporate a perfect Mug-Spotting, chart-topping, “Double A”.